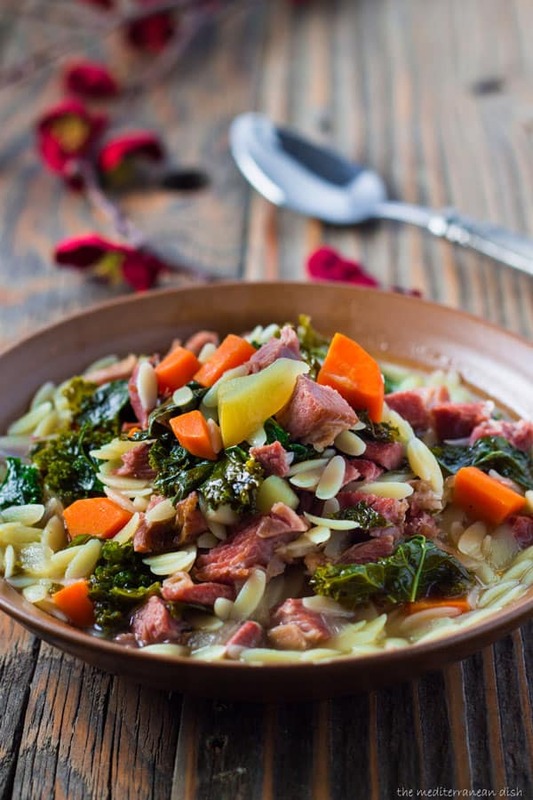 How about a little leftover turkey orzo soup? Imagine with me. ‘Tis the day after the big Thanksgiving feast. You blame aunt Gertrude’s pecan pie for the extra five pounds you gained; totally her fault:-) You are most grateful for stretchy sweatpants, and you plan to wear those all day as you continue feasting on Thanksgiving leftovers! I am right there with ya! But now, you stare at your leftover turkey wondering, is there any way around a dry turkey sandwich? Yes! 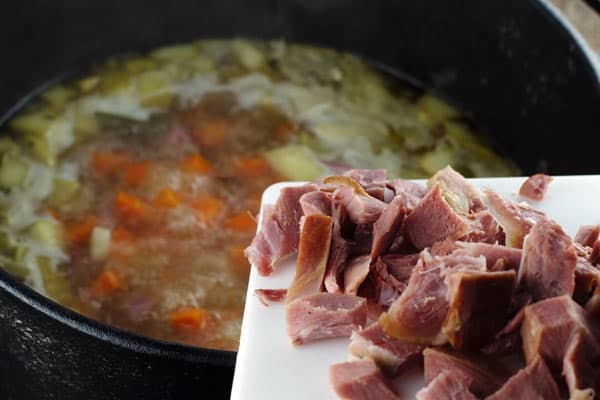 How about a quick leftover turkey soup? And let’s add a little orzo for a Mediterranean twist. 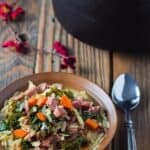 There are lots of ideas for how to use up your leftover Thanksgiving turkey like this turkey pot pie; or The Pioneer Woman’s lovely turkey and Swiss panini; or my friend Kristin’s crockpot quinoa turkey soup. Although Kristin’s recipe calls for ground turkey, I’m thinking chunks of leftover Thanksgiving turkey will do! I will confess that I don’t really love turkey, which is probably why I don’t use it very often. But this soup worked for me. And I think I’ll make it throughout the year. I mean why not! 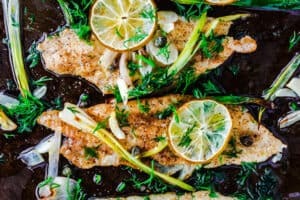 It packs great flavor from garlic, onions, thyme, nutmeg, bay leaf, and fresh mint leaves! Could always use other fresh herbs like parsley or cilantro, if you prefer. And I do love orzo pasta, a great ingredient from my childhood days. Like I said earlier, this was a quick recipe to put together, which leaves enough time for other fun things like Black Friday shopping*. I don’t know about you, but I do enjoy shopping 🙂 And if you ask my husband, he would say that I love it a weeeee bit too much! But I promise, I do find good deals 🙂 How about you? Do you enjoy the busyness of the mall or do you appreciate browsing online deals* at home? 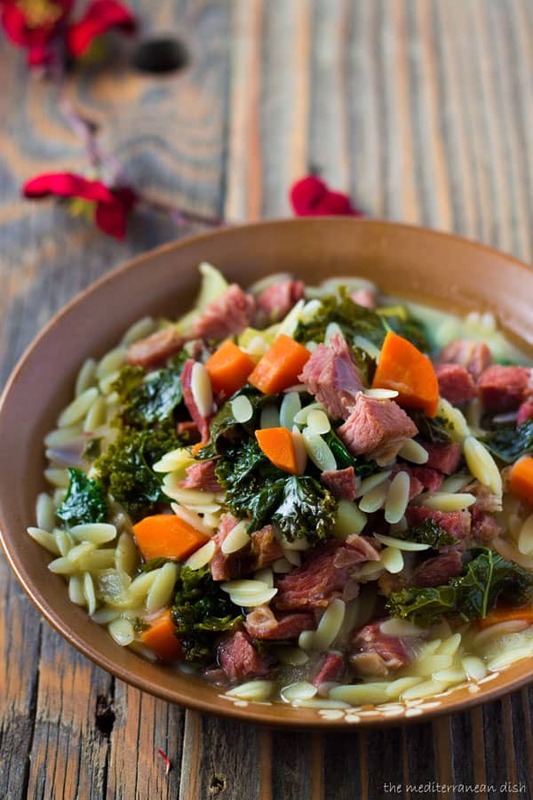 If you like an easy day at home, why not relax with a cup of my leftover turkey orzo soup? 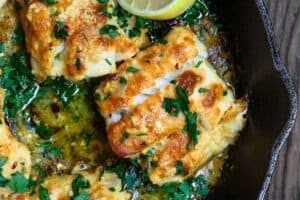 Please pin this recipe and make it soon! Let me know how it goes. 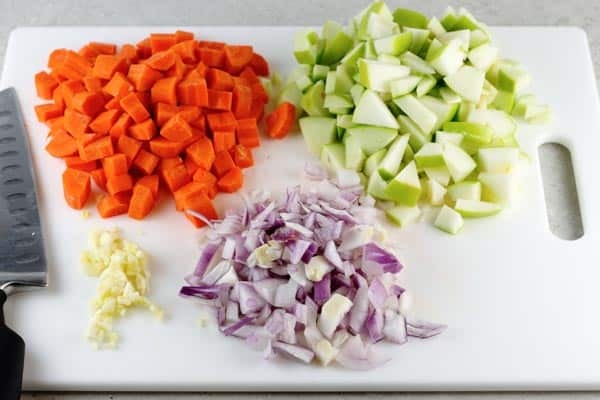 Chop up carrots, apples, onions and garlic. 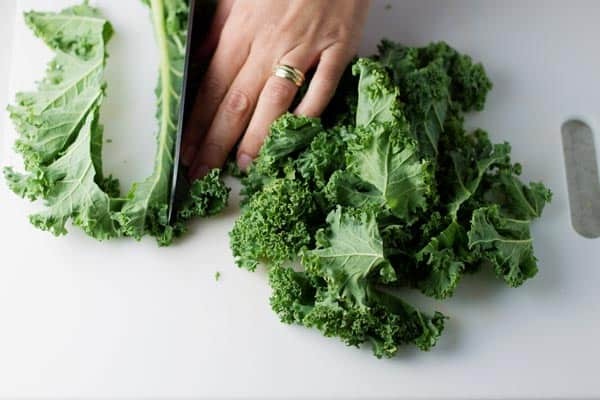 Remove kale ribs, and roughly chop. In a large and heavy cooking pot, heat 2 tbsp of olive oil. To that, add carrots, apples and onions. Saute for five minutes on medium-high heat, tossing occasionally. Then add chopped garlic, thyme, nutmeg, bay leaf, salt and pepper. Toss together briefly. Add chicken or vegetable broth. Bring broth to a boil and then add small chunks of turkey. 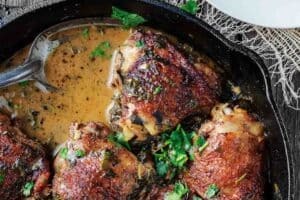 By the way, I used turkey leg meat. 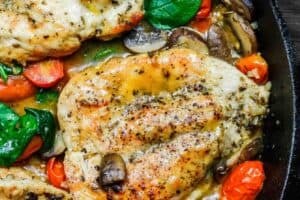 You can use turkey breast or a combination; whatever you have. Bring back to a boil and add the orzo pasta. Let boil on medium-high for five minutes. Add kale and mint leaves; then turn heat off immediately and cover. Leave the soup covered for five minutes until orzo cooks to al dente. Uncover and add lemon juice. Stir to combine. Serve hot with your favorite bread! I am cooking up lots of special recipes; leave me your e-mail here so I can share them directly with you! Would love to stay in touch on Pinterest and Facebook. 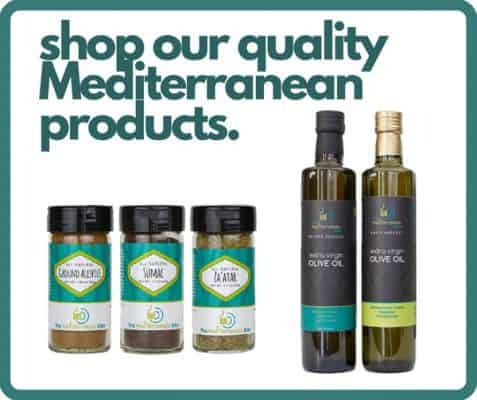 *Disclaimer: The Mediterranean Dish is an Amazon affiliate. If you reach Amazon through our website and make a purchase, I receive a small commission to help support this blog. I recommend Amazon because I have used it for years and appreciate what it offers in convenience, pricing and service. Happy black Friday/cyber week shopping! 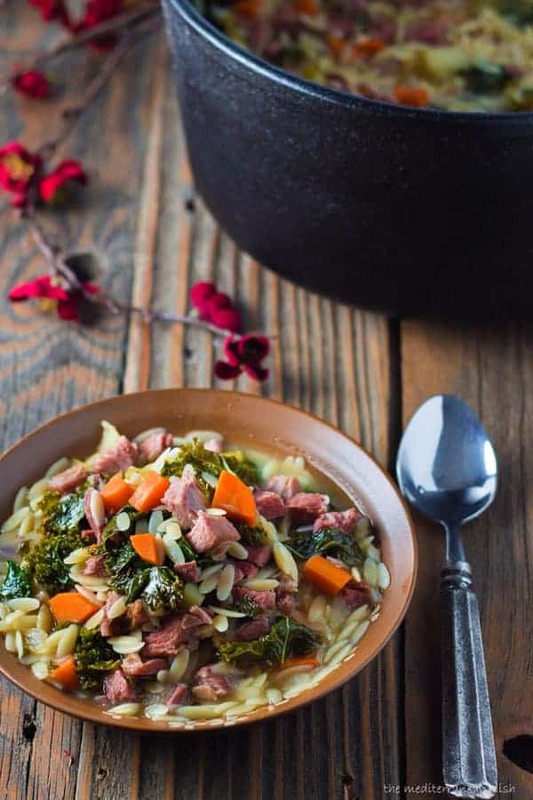 How about a little leftover turkey orzo soup? Give this delicious hearty recipe a try. In a large and heavy cooking pot, heat 2 tbsp of olive oil. 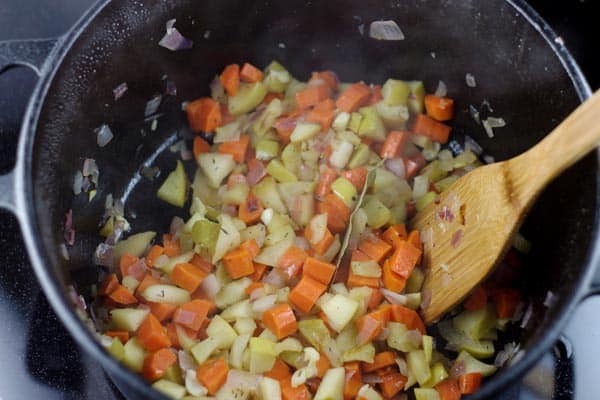 To that, add carrots, apples and onions. Saute for five minutes on medium high, tossing occasionally. Now add chopped garlic, thyme, nutmeg, bay leaf, salt and pepper. Toss together briefly. Add chicken or vegetable broth. Bring broth to a boil and then add turkey meat. Add kale and mint leaves; then turn heat off immediately and cover. 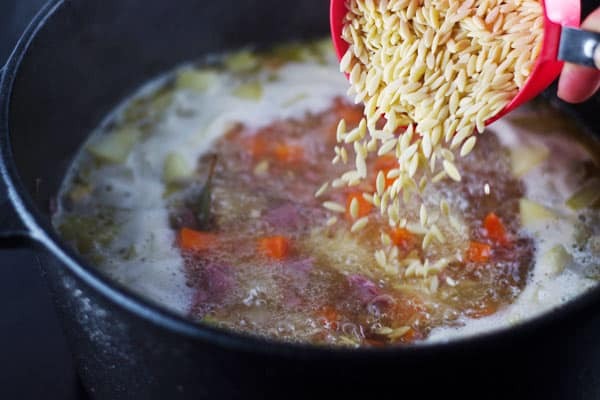 Leave the soup covered for five minutes until orzo cooks to al dente. Uncover and add lemon juice. Stir to combine. Serve hot with your favorite bread! Enjoy. Delicious soup recipe…made and used homemade turkey stock …also added celery…wondering if this soup would be a free able type soup? Thanks so much, Lisa, for your feedback. I am not sure what “free able type soup” means. Would you clarify, please? Awesome!!! 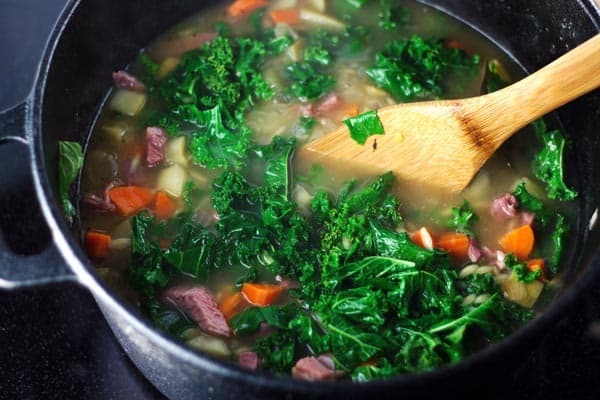 I was intrigued by ingredients that were a step ahead of other kale veg soup recipes. 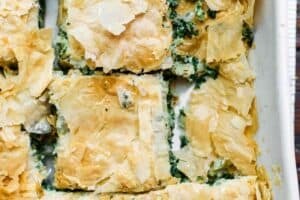 These included the use of apples, nutmeg and mint. So I made it, using some rich turkey stock left over from Thanksgiving. I pretty much followed it to the letter with only very minor tweaks. I did use homemade turkey stock. I added celery to the veggie mix just because (no biggie). I used home-smoked leftover turkey meat which did add a smokey note… And we use a gluten-free quinoa orzo. Oh and only had fresh thyme so use greater volume (dried is stronger than fresh) and mashed it up in my mortar/pestle. The only thing here that might have changed flavor would be the smoked turkey. The soup is awesome. The apple adds a lovely flavor as soes the subtle note from the nutmeg. I love this soup. Light and very wonderful for a late fall meal. Hi Lynnie! Thanks so much for sharing! I am glad you enjoyed the soup! Thanks Maureen! It is hearty but light at the same time. Happy Thanksgiving! That soup is amazing. There’s so much goodness in there and the colors are brilliant.